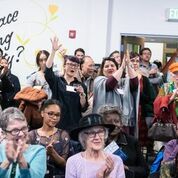 EBHO members, together with our partners across the East Bay and the entire state, worked tirelessly on the November 2018 elections. On November 6th, our efforts paid off. California voters said YES to affordable housing at the polls, leading some of the most historic affordable housing victories in a generation. You went door-to-door. You called voters. You gave 45 presentations at congregations and town halls across the East Bay helping us reach nearly 2000 supporters. You reached deep into your pockets to build these winning campaigns. Just by talking to friends and family about housing issues, you continued to build buzz about taking action at the ballot box. While Prop 10 did not succeed and shows the need for continued momentum and education, seven out of the eight measures that EBHO endorsed went the way we hoped. The overwhelming message is clear: At the state level and in individual jurisdictions, California voters are stepping up for housing solutions. Thank you to EBHO members, coalition partners, affordable housing resident leaders, and campaign contributors who took these measures across the finish line! Californians are taking action to fight back and expand affordable housing. In 2019, EBHO will continue to build bridges in more and more communities, train new affordable housing activists, develop housing policy innovations, and lay groundwork for future electoral campaigns. Thank you for being with us – because when we work together, we win. If you haven’t committed to affordable housing in 2019, please join EBHO or renew here right now.